Not really suitable for formal neatly clipped hedges, best allowed to do their own thing for the best deterrent effect. If you don't want to give the impression of a hedge i.e. you want a shrub border instead, then mix up different types of Pyracantha and Berberis for functionality with beauty. If you are going to use a hedge to deter burglars, keep them low to make sure you don't give a burglar a screen to hide behind. You will be able to find much longer lists of burglar proof plants, these three do the job as they are readily trainable and attractive enough for you want to have them almost anywhere in your garden. If you need height quickly, an easy way to attach a trellis to the top of an existing wall or fence, while secure in itself, it makes a very unstable obstacle to climb over and burglars don't like that. 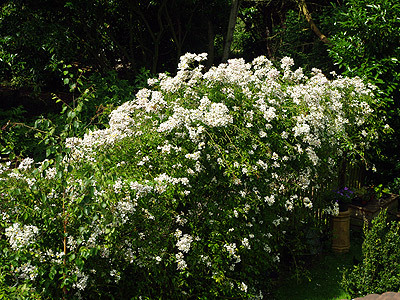 For extra effectiveness a large rambling rose grown up and across the trellis is very effective. A very varied group of evergreen or deciduous flowering shrubs with a variety of leaf colours especially in the deciduous types where autumn colour may also be very good. Not obviously spiny at first glance, the numerous needle-like thorns are borne just underneath the leaves so a harmless looking plant can give a quite unexpected "bite". They are an exceptionally useful group of shrubs for their ornamental value too. Berberis darwinii is a real star, smothered in dark orange flowers in mid to late spring with sometimes a further show in the autumn evergreen, particularly good for hedges, to 10ft high and wide. Berberis thunbergii is a good deciduous form that comes in a variety of leaf colours from the vibrant yellow young foliage of "Aurea" (to 6ft x 6ft) to the speckled rose and purple forms such as "Rose Glow" and "Atropurpurea" the last one has fiery red autumn foliage. Flowers of red, pink or white depending on variety. Best in sun especially for foliage colour and flowers, will tolerate some shade. One of the most useful garden shrubs, evergreen, tough and resilient to most things (though fireblight disease can be a problem as can woolly aphids to a lesser degree), usually unfussy about situation and soil. They can be pruned pretty hard and made to grow in the directions we want without sulking. They're evergreen, produce loads of lightly scented white flowers in the spring and thousands of brightly coloured long lasting berries in the autumn of shades from red through orange to yellow until the blackbirds come and eat them. Viciously thorny and makes a good burglar-proof hedge or spot planting against vulnerable downstairs windows, fences etc. Can be grown as a free-standing shrub or most usefully trained against a wall or fence. There are a great many varieties available some being upright and some more prostrate and in different berry colours. Withstands some shade and reasonably tolerant of soggy soils. 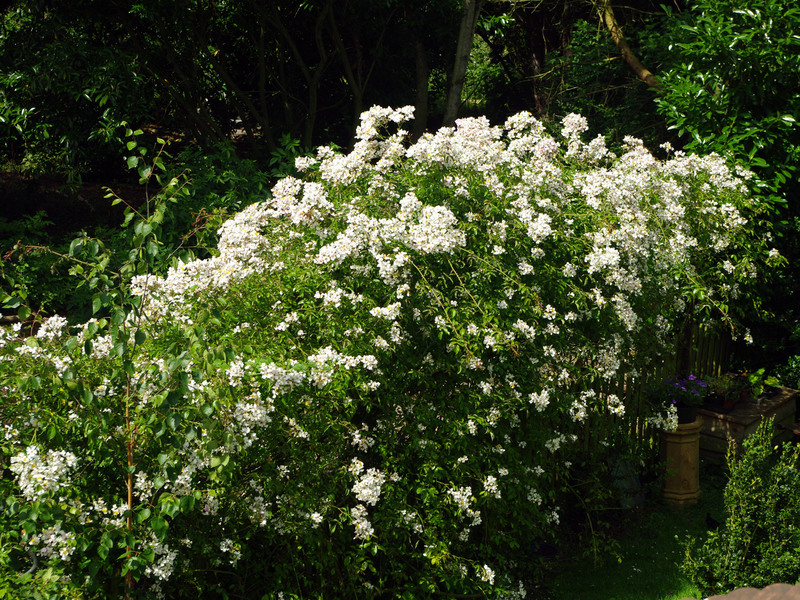 Rosa felipes "Kiftsgate" is a rambling rose that always wanted to be a tree. You need space for this one and a large support. It can be run up and along fences, walls of almost any height, though needs to be trained to go where you want it at least to begin with. I've also seen them doing well grown along a low long post and rail fence where the length of run has made up for lack of altitude. 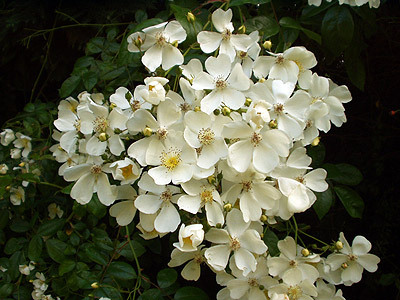 A wonderful plant, hardy and vigorous with an indecent quantity of large sprays of white scented flowers taht fill the whole garden with fragrance on a calm day. A good intruder barrier, the thorns were rejected by the people who invented barbed wire because they were too brutal (I just made that bit up - but I wouldn't try and climb through it, no matter how drunk). - Scrambler - backwards pointing thorns, need tying in at first. Other rambling and scrambling roses can also make good barriers to put unwanted visitors off. Buy rambling and scrambling roses.